Put some funky color and style back into your look with super wearable comfort in the SKECHER Street Solei St. - Groovilicious shoe. 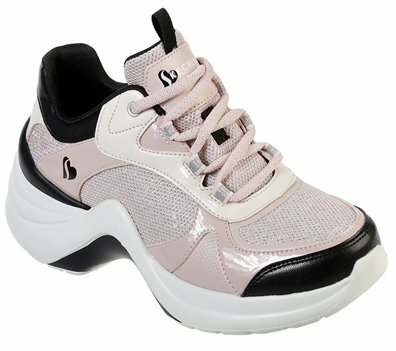 Smooth synthetic, shiny metallic synthetic and sparkle mesh fabric upper in a lace up casual fashion wedge heeled sneaker with stitching and overlay accents. Sculpted Solei St. midsole, Air Cooled Memory Foam insole.